Although I already own the Pop! figure of Anna in her winter outfit, Anna's Coronation dress is my favourite outfit of hers and I'd love to cosplay in it some day so I think I'll definitely have to add this one to my collection too. And for the adorableness factor, I've got my eye on BB-8, Mrs Potts and Chip and Toothless. I pretty much fell in love with BB-8 after watching The Force Awakens, and until I can afford one of the super cute BB-8 robotic droids by Sphero, this little Pop! figure should satisfy my BB-8 cravings! I think I'll have to wait until I see Pride + Prejudice + Zombies first, but as long as the film is at least half-decent, I can't turn down the opportunity to own an Austen-based figure. Elizabeth Bennet is one of my all-time favourite heroines (even without the zombie fighting badass-ery!) so I was really excited to see these Funko was making these figures! And finally, I'm a huge fan of Disney's animated Alice In Wonderland, I used to watch the film over and over again when I was little, so I'll have to add Alice to my collection at some point too. 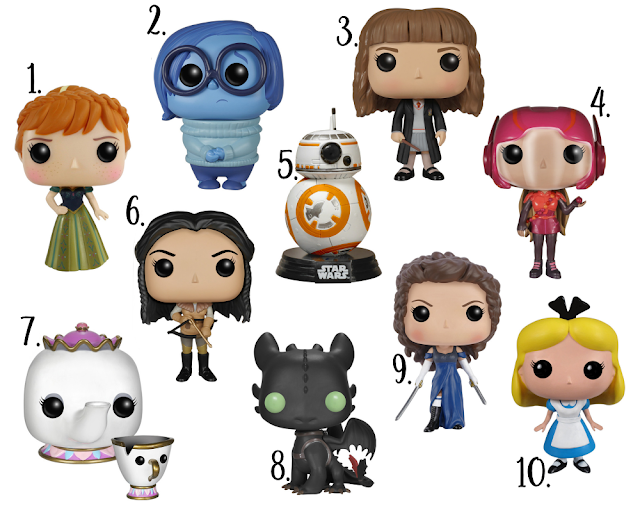 Do you own any Pop! figures? Which ones do you want the most?